This release note describes the new build for Appspace App v1.36. Support for natural duration on Meeting Room Cards. Verified DHCP Option 43 on BrightSign devices. Includes various improvements and bug fixes. 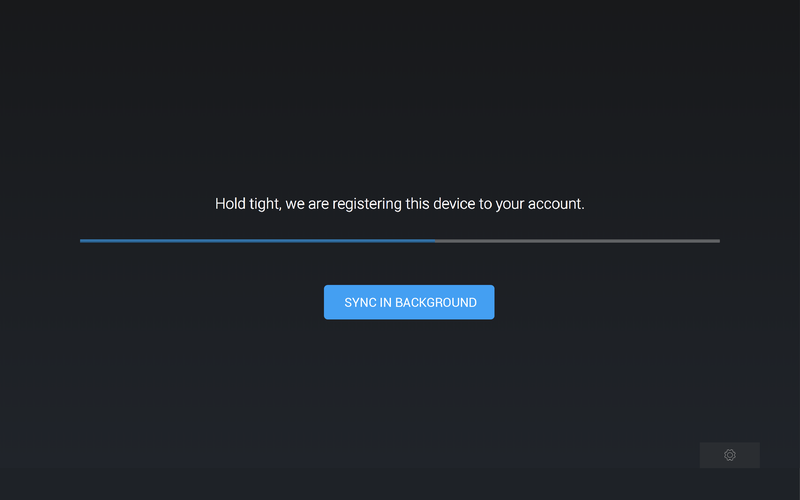 Previously, when a channel was unassigned from the device, the app would continue to play the previous channel until a new channel was assigned or until the device was reset. Administrators will be able to perform automated device registration for BrightSign devices using DHCP Option 43. By configuring a network for DHCP Option 43, and hosting the policy file in a server and executing a provisioning script to retrieve the policy file, any BrightSign device in the network will automatically look at the Recovery URL that has been defined for automatic registration. Support for natural duration on Meeting Room cards in advanced channels. If the card has a natural duration, then the app will follow that natural duration value unless an explicit duration has been set for the content item. if a card with natural duration has a content duration set, then the card is displayed according to the content duration. if a card with natural duration does not have a content duration set, the card is displayed indefinitely. if there is more than one layout, the card will play based on duration set on the layout. AE-4331 - BrightSign auto-registration via policy.json doesn’t work using DHCP Option 43. AE-4388 - Although transition is set to “none”, the images in a playlist fade out, playing the fade-in-fade-out transition by default in an advanced channel. Devices running Android 4.4.2 and below, do not contain the required OS requirements to handle the video buffering improvement needed for seamless video transition playback. BrightSign firmware 7.0 causes the Appspace App to reboot after a period of time, due to a potential memory leak. It is recommended that BrightSign firmware 6.2.147 is used until the issue with the latest firmware has been resolved, which will be announced soon. Chrome OS devices that have been recently updated to version 66 and above, may experience video content not playing automatically. This is due to the autoplay policy changes starting from Chrome OS 66. Set the Autoplay policy setting to “No user gesture is required”, and notice that video content now plays automatically via Appspace App on Chrome. Chrome OS devices that have been recently updated to version 65 experience display/video issues. This is due to a bug that exists in Chrome OS 65. We recommend pinning Chrome based devices at Chrome OS version 64 for Appspace App to work seamlessly. 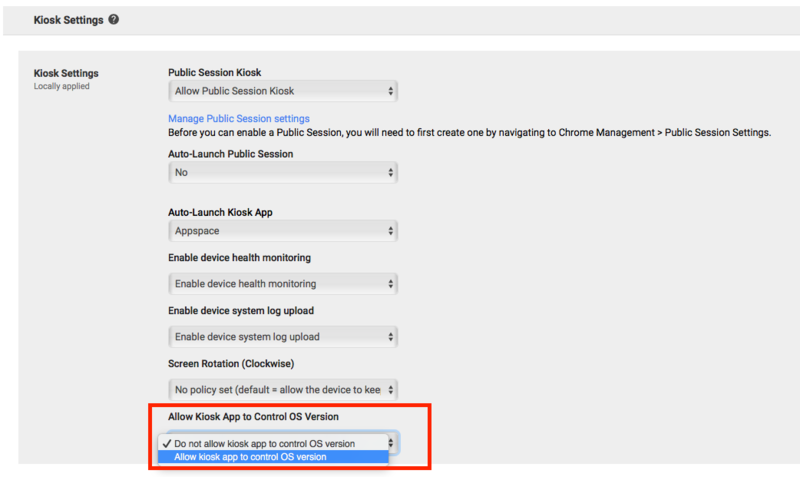 We recommend using Google Chrome Enterprise, previously Chrome Device Management (CDM) to manage your devices. 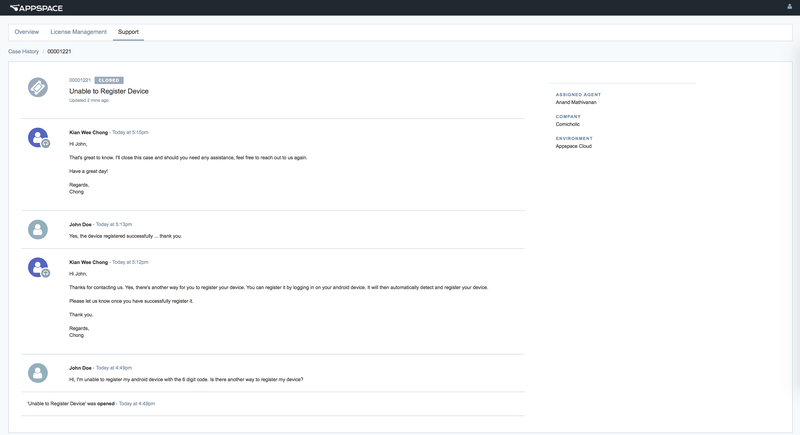 We currently only support issues that arise on Appspace App if the device is managed via a CDM. If you have devices updated to Chrome OS 65 which have not been impacted, do not reboot the device. If you have a CMS which auto reboots the device overnight, please disable the auto reboot. If you have devices updated to Chrome OS 65, perform a manual downgrade to Chrome OS 64 using a USB recovery image. For help, please refer to your device manufacturer. Do not update to Chrome OS 65.